Oh, what a crazy time it is. Mr. T turns ten today, and Lulu turns sixteen on Halloween. Multiple cakes and celebrations are involved. Also, I’m trying to fabricate a Thor costume primarily from duct tape. But that’s the sticky stuff of another post. I haven’t managed a post here in a few weeks. But after writing my last one, on making reading and writing enjoyable on a daily basis, I undertook a little experiment. For a few days I tried to note whenever I saw Mr. T involved in an act of reading or writing. There is no way I caught every occurrence; who knows how often the kid picks up an atlas when he ought to be putting on his pajamas, or labels a map before running out to the backyard? Daytime read-aloud: Adopted by Indians by Thomas Jefferson Mayfield. This is a bit of an aside, but I have to share: Mr. T and I are exploring California history this year, and going on monthly trips to historic sites with a few other families. We’re reading this book along with our study of local native people. So interesting! It’s the true story of a Texan boy who came to the Gold Rush with his family, and was taken in by a local tribe. Apparently Mayfield never told his story until just before he died, and a teacher-friend transcribed it for him. It’s fascinating to hear about San Francisco before it was even called San Francisco, and to hear what the Central Valley looked like when it was practically untouched. Bedroom audiobook: The Fellowship of the Ring by Tolkien. This is the book of the month for T’s book group. T would never have the patience to read it at this point, so I checked out the audio version for him. Sixteen disks! Actually, T often “reads” his book club books via the audio version. Is this cheating? I don’t think so. Can T engage in a discussion on the book at his meeting? Yep. Seems like that’s the point. Car audiobook: The Evolution of Calpurnia Tate by Jacqueline Kelly. T almost always chooses the audiobook we listen to in the car; I really wanted to hear this one so insisted on picking for a change. What a fantastic first-person narrative! Reminds me a lot of the young female narrator in the recent film version of True Grit. Calpurnia uses lots of wonderful, old-fashioned words that should never have become lost to us. Big surprise: T likes it, especially the admiration for Darwin and the natural world that Calpurnia and her grandfather share. An information packet about Fort Ross, a local historic site and the location of an upcoming living history overnight that T and I will be attending. T’s taking a class with other kids who will be attending the trip. Reading the packet was an assignment for the class, yet T kept dragging his feet about getting it read. Instead of nagging him, I read the packet aloud. Suddenly he found the content fascinating and it prompted all sorts of discussion. And I reminded myself that reading aloud is sometimes what it takes. Reading about Lego Ninjago online. To some parents, I suppose, this could seem like frivolous commercialism. The thing is, T isn’t reading because he’s lusting after the toys. (Although he wouldn’t mind a few of the small sets for his birthday.) No, what interests him is the Ninjago world and all its inhabitants and their interactions. (How do I know? I asked.) It may be online reading, commercially produced, but still, T is reading and absorbing and considering the information. Pretty much the same as he does when he reads an interesting book. Practice questions for upcoming Geography Bee. My young geography freak is considering entering a local bee, so he and I took turns reading and answering questions from last year’s bee. And yes, he puts me to shame. Many searches for images of Thor, as Halloween costume research. One led us to the very fun site of comic book artist Chris Giarrusso. Fantastic place to visit for comic-loving kids. A search for the word used when meeting with a king, which neither of us could recall. (“Audience”). Are Google searches writing? Most definitely, I would argue. In order to search successfully, you need to refine your goals and tinker with your terms. The ability to find information is crucial for kids in this digital world. Continued work on his nonfiction piece on Lego Universe for our Writer’s Workshop. T is just beginning to type some of his writing on his own, and is very motivated to do it. Exciting. A questionnaire for developing his Fort Ross character, required for the Fort Ross class. Not writing he wanted to do, and he did a minimal job. I had to encourage him to move beyond one and two-word responses. (What do you look like? Handsome!) Still, I didn’t push too hard; I think that would have only made him dislike the activity altogether. This goes to show the difference between assigned projects and self-chosen ones, like the Lego Universe writing mentioned above. I’d hate to think of how T’s writing might (or might not) be developing if he were in school and not given many opportunities to write on topics of choice. Many lists of invented characters and maps of invented worlds. I find these scattered around our house like dust bunnies. Writing and responding to friends in the text box while playing Lego Universe. A thank you postcard to his grandparents. Funny thing is, these were three very busy days, three days in which T and I had minimal time working together. Still, I’m amazed at how much reading and writing actually took place. I also notice that most of the examples here fall outside the scope of traditional reading and writing instruction. Reading comic books and Lego websites? It’s reading! Googling Thor and messaging while gaming? Writing! There were times in which I helped T out, scaffolding the learning for him: reading aloud when he didn’t want to read something, finding audiobooks when reading was challenging, not pushing too hard on a class assignment. Also, there were many small acts of reading and writing: casual conversations, Google searches. Sometimes I think we parents don’t notice these small moments, but a reading and writing education can be built on them. Consider noting the reading and writing going on in your days. It can be surprising! I’d love to hear a few random examples of how reading and writing creeps into your lives. Your examples will help readers better understand the point of my last post: You can help your kids love reading and writing every single day. At toddler/preschool level: making a “list” of “things for the baby” (zigzag lines down a page); “writing” in journals (dictating stories for me to write, then illustrating them); looking over my shoulder as I read aloud and wondering why the word I just said didn’t sound like it started with T, though there was a T at the beginning (leading to an ongoing-throughout-three-days discussion about /th/); finding Ls on the bottom of your shoes like the Ls in your name and your mothers’ name!, etc, etc, etc! Such sweet examples of your daughter’s literacy! That’s how they learn, right? It doesn’t have to change as they get older. I love The Evolution of Calpurnia Tate, it’s one of my favorite books ever. I read it about six months ago, and then just recently I picked it up again, and it’s soo good! Also, we have the book Adopted by Indians, and used it for California history too! Long comments are my favorites, Kate! I’m especially glad that you shared your reading and writing list, as a kid, because you remember all of the important details. We parents might not even notice you reading something like a CD lyric booklet, but you’re right–that’s reading! Music lyrics are a form of poetry, really. What fantastic things you’re doing! Working at your literary magazine and planning for NaNiWriMo, especially! Impressive. And I’m flattered that reading my blog and leaving a comment made it on your list. 😉 Thanks so much for sharing what you’re doing. It’s inspiring! This post comes at an interesting time in our household. My youngest daughter is 7 years old. Every year at my her school the children are asked by the Librarian to keep a reading log of all the books that they read during the year. Once the student has reached 100 books they are invited to a special “Hundreds” party at the end of the year. This year the grade 2 teacher also asked that the children keep a reading log. I contacted my daughter’s teacher and suggested that trying to keep track of everything my daughter was reading on two reading logs would be onerous and even counterproductive given her voracious appetite for reading. The teacher agreed and my daughter was exempt from the reading logs but the she suggested I keep track of the first 100 books so that my daughter could be part of the Hundreds party. The log was completed this weekend but I realized, however, that the log is not really reflective of her true reading habits. As I was keeping track I noticed that she loves to reread books that she has already read, sometimes its only her favourite chapters. She has also been reading D’Aulaires Greek myths on and off for the past two months but has yet to complete it. Non-fiction books are also a favourite with her, this week she was leafing through a book on the desert, another on dogs and she frequently picks one up on Ancient China — again, she only reads sections that interest her and then she puts them aside for awhile. It is only the “completed” books that are recorded on the log. My kids have always dipped in and out of books, and re-read parts of favorite, just as yours do. There are always spread-open books lying all over the house! Also, lots of what they read isn’t in books: it’s online. 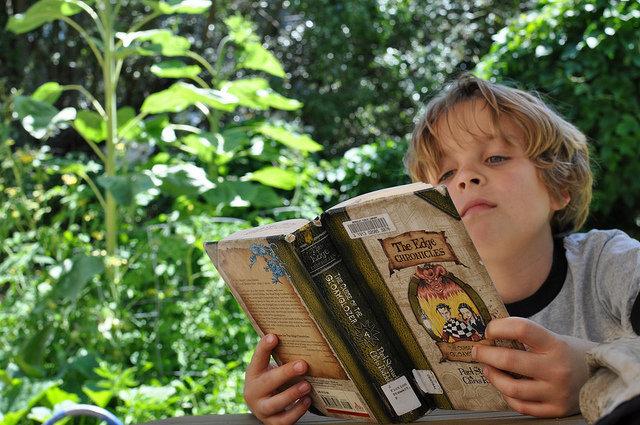 Kids read much as we adults do: little bits here and there, and big chunks at other times. I think that a lot of adults don’t value the little bits, or the re-reading, or the frivolous reading, or the non-book reading. But it’s all reading. I know you get that, Peaches! Now I too want to keep track of all the random reading and writing that Cecil does. It’s reassuring to know that it all makes a difference. We too are reading Wildwood at bedtime and loving it! We’re also reading Adopted by Indians during the day 🙂 Great minds, eh? Then again, you did recommend the second book. As for the Ninjago stuff, Aidan has recently become obsessed with Hero Factory, and this morning he was rummaging under his bed to find old copies of the Hero Factory comics, which he realized he had after he went on lego.com to look up previous issues. Want to know what Avery has been googling lately (besides DIY Christmas presents to put in glass jars)? Disasters and tragedies. Yesterday she looked up the question, “Has anybody been decapitated in Auburn?” After hearing on NPR about the high employment rate of graduates with actuarial science degrees, I told her she should google careers in Risk Assessment. T is losing interest in Wildwood, about 100 pages in. It does seem to be lagging–or is it that we’re lagging and tired when reading it? I’m a little sad about it. I’ll be curious to hear how it goes for you. Oh, that Avery! I wonder if her “Has anybody been decapitated in Auburn?” question landed her on anyone’s blog. Actually if her search did lead to a blog, I suppose I’d be rather leery of the blog! It just makes me think of all the funny search engine terms I come across that people have used to find my blog. The Google-as-all-knowing-oracle ones, like Avery’s, always crack me up the most. And now, of course, if anyone else searches for decapitations in Auburn, they’ll be led right here! I think you’re right about the strewing thing! So glad to know you’re still out there, and reading along. Wow, what a timely post! (That’s kind of a joke, what with it being 2013 and all.) Really though, I’m pretty sure this is the first time you mentioned Sandra Dodd- I’ve just been at a conference here in London with her, and am leaning more and more towards unschooling. I’m radical in my heart- it just makes so much sense to me, but my husband thinks the very notion of home schooling is radical enough, thank-you-very-much! So, we had a gentle little conversation today about which bits of his anxiety would only really be dealt with by waiting and seeing, (if it’s all going horribly wrong by the time Henners is, say, 7, will I refuse to acknowledge that, and press on, to his eternal detriment? Well, I can reassure him, (and yes, I’ve already chosen the fall-back-on school, and no, I haven’t phoned them to check there are spaces available,) but really how does he know?) and which bits we could maybe find some other way for him to learn about, (other than listening to my untrustworthy opinions!) to help him sleep at night. His family’s got a strong streak of dyslexia, and I know that’s come up a lot in your comments, and thanks to all who mentioned it. But he’s extra worried about literacy, naturally, and I was trying to describe the ways Henners might access the joys of reading before he reads independently, and also what sorts of things would perhaps drive his desire to learn, when he’s ready. So, what a perfect post this was, for me to read this evening! And perhaps for him to read and be reassured by, when he’s ready, except now I’ve written this comment. Whoops! I’ve written much more about how kids can acquire writing naturally; this post focusing on reading and writing is probably the best I have to offer for family members with concerns about reading. (And also the previous one: “love reading today! love writing today!”) I say, let’s delete and then you can send him my way! Previous post: love reading today! love writing today!